Paramo says:"The technical cut of the Velez reduces volume and weight and improves aerodynamics. 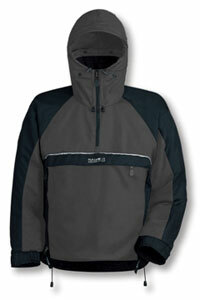 This highly Directional, lightweight waterproof jacket with twin-zip design is ideal for multi-activity use. Fully articulated shoulders and elbows with a cropped front ensures freedom of movement and optimum fit. Now 25% lighter in lining weight." Less prone to abrasion or damage through new reversed zips. Increased field of vision provided by a fully adjustable, wired and roll-away/detachable low profile hood. Access to inner layers and additional venting, even when wearing harness, with our front twin zip design. Single-handed on the move cuff adjustment provided by the BiteTab velcro closure. Easy access storage from a large external 'working' chest pocket. Handwarming and OS map storage provided by an internal 'dry' pockets. Excellent weather protection from our unique 2" drip skirt and scooped tail. Additional temperature control provided by single-handed hem drawcord pulls. Also helps eliminate rucking when load carrying. Increased visibility in low-light conditions with the addition of reflective piping front and rear. Now 25% lighter in lining weight. A problem I've had with smock-style garments in the past is the lack of side pockets into which I can put my (usually cold) hands when walking. Paramo have dealt with this problem quite creatively in the Velez. There is an internal 'dry', zipped pocket that can be accessed once you have opened the front zips. This works for me because my hands are cold a lot of the time. However I guess for some, the time when you need to warm-up your hands is the time when you absolutely do not need the additional 'ventilation' provided via the open front zips? So good try but I'm not sure it quite works. There is an excellently sized front pocket which is large enough to take and OS map, gloves etc. A shorter length, with generous scooped tail for weather protection, it has a nice close fit. I liked the overall styling which includes reflective piping on front and back plus roll-down hood which performed very well. I found the length, cut and shoulder design of the Velez was great for a training activity like Nordic Walking. I think, however, I prefer a longer length for more conventional hill-walking. The venting options come via the two-way side zips, the zip at the neck plus sleeves which can tightened at the cuff, left loose or rolled up to the elbow. As ever, the breathability and protection from rain is excellent. I've worn the Velez during 06/07 autumn and winter in sun, snow and persistent rain and I've always been dry and maintained a comfortable body temperature. If you're looking for a smock-style jacket with superb breathability & water-proofness plus extremely flexible venting then this is an excellent option. The cut and style make it a great choice for activities such as Nordic Walking or cycling. The shorter length may make it less attractive to someone who's looking for a jacket primarily for hill-walking.